The US Congress has spared the James Webb Space Telescope from the recent round of NASA budget cuts Amidst the recent spending cuts that has hit the National Aeronautics and Space Administration (NASA), one expensive instrument has survived the axe. With Congress giving the thumbs for the continued development of the James Webb Space Telescope, skywatchers still have a reason to rejoice. The telescope will feature a gigantic mirror, measuring 26 feet across.This would give it more than a dozen times the light-gathering power of the Hubble Telescope currently in orbit. That means it can capture clearer images, and at much greater distances. Or, to put it simply, the James Webb Space Telescope would be the most powerful telescope in history. 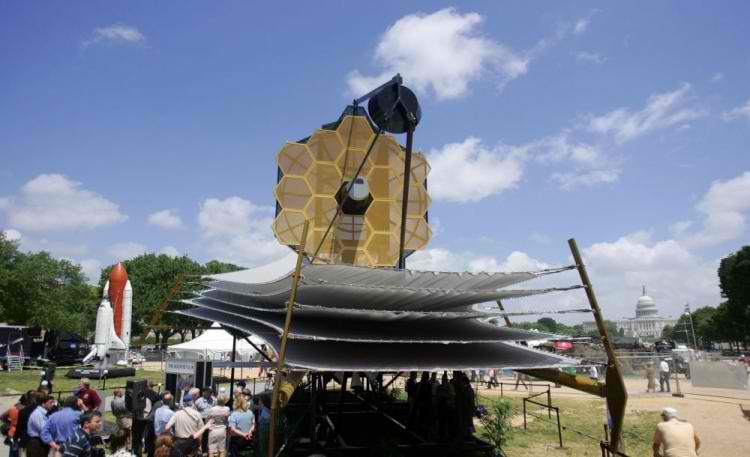 The decision to continue funding for the James Webb Telescope comes as a breath of relief, considering that the planned budget for it has ballooned from $500 million in 2007 to $6.2 billion, and the scheduled launch date moved to more than a decade later. In addition, a recently released 2013 budget by the White House slashed the funding for another space exploration-related mission: the NASA Mars program. But the telescope presents not only budgetary problems, but logistical ones as well. Its huge size means that it cannot be hoisted into orbit by any existing rocket. It also needs to be protected from the sun’s heat in space. By a sunshield that’s even bigger than the telescope, no less. Astronomers still have a lot of questions that current stargazing technology can’t solve. But once the James Webb Telescope goes into orbit in 2018, the images it brings will surely put many of those questions to rest.